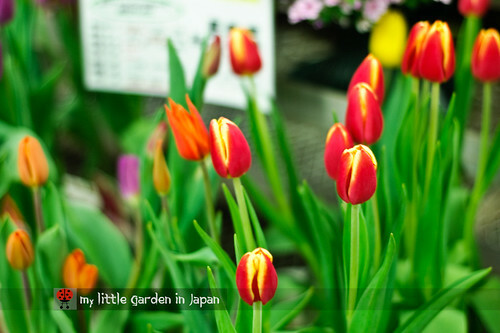 my little garden in japan: Tulips Sprouting in winter! We had a rainy and cold November here in Tokyo, but this December has been a bit more mild. This had some benefits for my little garden. For example, the seedlings are growing nicely, the strawberries got some strength and some of the flowers are forming new buttons for a winter bloom. But, the weather has caused one more surprise. My tulips are sprouting early! While I was watering the plants the other day, I noticed a little green head poking out of the ground . One of the tulips decided to sprout! Now, being a first time tulip grower, of course I got a bit worried. They were not supposed to come out until next year. So I went on-line and check what I could do. It seems that is not that of a big deal. It happens some times, the leafs might grow and if they are strong they can survive, or if it is too cold they will go brown. But, if everything goes ok, the bulbs will not be affected and will still grow one more time in spring and bloom nicely. For now all I can do is cover the little green sprout and wish the cold will stop its growth. At least now I know that they did not got rotten, and they are growing down there. Patience is key, I just have to wait and hope for the best. Also, the other day while going to the garden center I saw some very beautiful autumn tulips for sale there. I was tempted to get some, but I know I would not have the space. Maybe next year. On a different topic. I will take a couple days for going on a short trip to Hong Kong. So I will not post any until late next week. I hope you all have a very nice holiday. Merry Christmas! 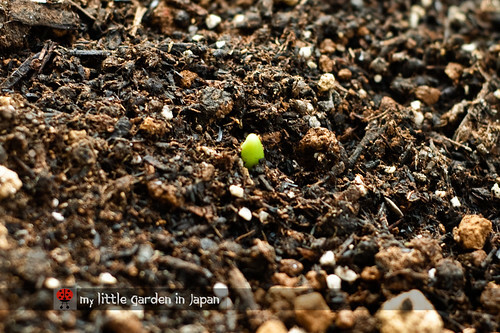 Great to see a gardening blog from japan. I am glad to see your tulips sprouting for you. In our subtropical climate it is always a challenge to grow them. Our tulips bloomed late this year due to the cold winter we had, I'm sure it will be the same again as we're having very cold weather at the moment. Enjoy your trip to Hong Kong. Merry Christmas to you too. Some of our bulbs have pushed through the soil but we haven't seen them for several weeks due to the snow - not a mild December here abd certainly no flower buds for the foreseeable future. The snowdrops should be first. Have a great holiday in Hong Kong, Fer. I never knew you could get Autumn-flowering Tulips... I don't think they would survive our Autumn! My Daffodils and Irises are also just beginning to appear, but I know from experience that they won't come to any harm. Wow! You are growing tulip too, amazing Fer! Looking forward to the flowers like you..Happy holidays and Merry Xmas Fer! One of my happiest gardening moments in the spring is finding the little green sprouts poking out of the ground. I don't plant tulip bulbs because we have too many squirrels and they are very fond of tulip bulbs. I have lots of daffodils, crocuses and hyacinths. We have about a foot of snow on the ground and spring feels very far away. Tulips, you are making me jealous. I have sooo long to wait to see them again. I've had this problem before as well. Bulbs that wanted to start sprouting too early. The tips usually pop up and then get frozen but the plant itself survives with no problems. A bit unnerving the first time it happens. I look forward to the progress of your tulips...they are my favorite cut flower! Merry Christmas fer and safe travels! I bought some fresias as an autumn present for friends, didn't send them in time and they seemed to have dried out so I bought a different present and planted the little bulbs in a bowl in my kitchen, thinking maybe one would sprout. Now there are lots of little green spikes. I should have sent them after all. I'm not sure they should be growing so fast though! I remember some of our daffodils coming up really early. Asking the extension agent, his reply was that the plant will come up in stages, when it is warm, there will be a little growth. When the temps get really low, the plant goes into a semi-dormant stage. Plants are smart! Great to read your post. I like tulip so much but with our climate I cannot plant this flower. I hope the best for your tulip. Merry Christmas and Happy New Year! at the moment here in Aberdeen Fer. I did see signs of the Snowdrops before the thick blanket of snow arrived. Have a great Christmas. Have a good trip. Perhaps your Tulip thinks the weather is about to get warmer! Merry Christmas! Enjoy Hong Kong! Eat some roast goose for me. Merry Christmas. I hope that you will enjoy your visit to Hong Kong. The thepareture in Japan will down from the Christmas eve so I hope you can get prepared to protect your vegetables and tulips. 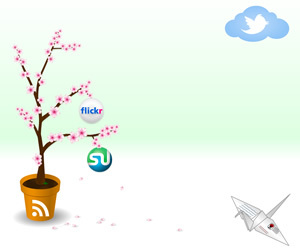 Refracting this year, I am very happy to know you on the Internet and exchange ideas on gardening. I believe we can harvest more vegetables and blow much flowers nest year! Wishing a merry Christmas to all my followers! Btw, are you my follower? I'm yours! Merry Christmas to you and like we say in Greece "Kronia polla". The first sprouts of a bulb are always cause for excitement! Merry Christmas! There's nothing as much fun as watching bulb sprouting. Hard to be patient, I know! Cute photo, too. Isn't it nice to see that in the middle of winter! It always gives me hope for the coming spring! Dona~ of course I am your follower! I've had tulips poking through very early in mild winters. They've gone on to create a good display, so don't worry!